INOX Laser Art creates personalized laser-engraved designs for any commercial, residential or hospitality project. Shown: white. We heard from hoteliers and designers that needed personalized laser art on their door hardware, but had to ship the product elsewhere for the work to be completed. 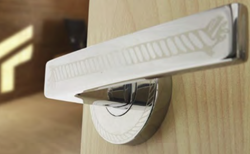 With INOX Laser Art, we are able to create custom designs on our hardware in-house as a more efficient, cost-saving solution. 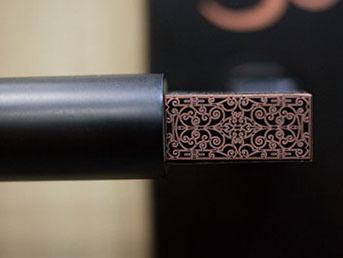 INOX®—creator of innovative and premium decorative hardware and door locks for more than 25 years—debuts INOX Laser Art™, which offers personalized engravings on INOX hardware in four options: black, white, color and copper reveal. INOX is the only door hardware manufacturer in the industry to house a vanadate diode laser, creating this customized laser work on location. Ablation partially removes the coating layers to expose the base material, which is used for the copper reveal option shown.